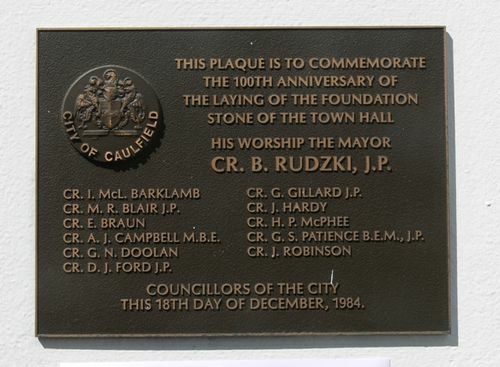 A plaque commemorates the 100th anniversary of the laying of the foundation stone for the Town Hall. Built in 1885, the Caulfield Shire Hall, as it was first known, was originally much smaller in size. The building was designed by Shire surveyor Sydney Smith although his original design was much more elaborate. Due to cost issues only part of Smith's design was implemented. The foundation stone was laid in December 1884 by Shire President J W Crosbie. A second storey (without the tower top) and a portico were added in 1891. Cr. I. McL. Barklamb Cr. G. Gillard J.P.
Cr. A. J. Campbell M.B.E. Cr. G. S. Patience B.E.M. |Cr. D. J. Ford J.P.